Lineage. Constituted as the 317th Transport Group on 2 Feb 1942. Activated on 22 Feb 1942. Redesignated 317th Troop Carrier Group on 4 Jul 1942; 317th Troop Carrier Group, Heavy on 21 May 1948. Inactivated on 14 Sep 1949. Redesignated 317th Troop Carrier Group, Medium on 3 Jul 1952. Activated on 14 July 1952. Inactivated on 12 Mar 1957. Redesignated: 317th Tactical Airlift Group on 15 Sep 1978. Inactivated on 1 Apr 1980. Redesignated: 317th Operations Group on 1 Jan 1992. Inactivated on 16 Jul 1993. Reactivated on 6 Jul 2017-. Componants. Squadrons. 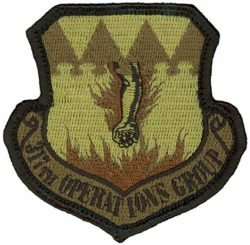 39th Transport (later Troop Carrier, Tactical Airlift, Airlift), 22 Feb 1942-14 Sep 1949, 14 Jul 1952-12 Mar 1957, 15 Sep 1978-1 Apr 1980 (attached to 313th Tactical Airlift Group 5 Jun-14 Aug 1979), 1 Jan 1992-1 Jun 1992. 6 Jul 2017-. (attached to 313th Tactical Airlift Group after 3 Apr 1992); 40th Transport (later Troop Carrier, Tactical Airlift, Airlift): 22 Feb 1942-14 Sep 1949, 14 Jul 1952-12 Mar 1957, 15 Sep 1978-1 Apr 1980 (attached to 313th Tactical Airlift Group, 29 Nov 1978-16 Feb 1979), 1 Jan 1992-16 Jul 1993. 6 Jul 2017-; 41st Transport (later Troop Carrier, Tactical Airlift, Airlift), 22 Feb 1942-14 Sep 1949, 14 Jul 1952-12 Mar 1957, 15 Sep 1978-1 Apr 1980 (attached to 313th Tactical Airlift Group, 5 Dec 1979-12 Feb 1980), 1 Jan 1992-16 Jul 1993; 46th Transport (later Troop Carrier), 15 Jun 1942-18 Aug 1948; 317th Operations Support, 1 Jan 1992-16 July 1993, 6 Jul 2017-. Stations. Duncan Field, TX, 22 Feb 1942; Bowman Field, KY, 19 Jun 1942; Lawson Field, GA, 11 Oct 1942; Laurinburg-Maxton Airport, NC, 3-12 Dec 1942; RAAF Base Townsville, Australia, 23 Jan 1943; Port Moresby Airfield Complex, New Guinea, c. 30 Sep 1943; Finschhafen Airfield, New Guinea, Apr 1944; Hollandia Airfield Complex, Netherlands East Indies, Jun 1944; Dulag Airfield, Leyte, Philippines, 17 Nov 1944; Clark Field, Luzon, Philippines, c. 17 Mar 1945; Motobu Airfield, Okinawa, 25 Aug 1945; Kimpo Airfield, Korea, 31 Oct 1945; Tachikawa Airfield, Japan, c. 15 Jan 1946 – c. 21 Sep 1948; Wiesbaden AB, Germany, c. 30 Sep 1948; Celle RAF Station, Germany, 15 Dec 1948-4 Sep 1949. Rhein-Main AB, West Germany, 14 Jul 1952; Neubiberg AB, West Germany, 21 Mar 1953-12 Mar 1957. Pope AFB, NC, 15 Sep 1978-1 April 1980. Pope AFB, NC, 1 Jan 1992-16 Jul 1993. Dyess AFB, TX, 6 Jul 2017-. Aircraft. C-47, 1942-1948; B-17, 1943; B-24, 1943; C-39, 1943; C-60, 1943; C-46, 1948; C-54, 1948-1949. C-119, 1952-1957. C-130, 1978-1980, 1992-1993, 2017-. Operations. Combat in Southwest Pacific Theater, 1943-1945. Established initial command and control network and provided troop carrier and courier service in the Far East for the occupying forces of Japan. Provided support for Occupation of Germany and Berlin Airlift, 1948-1949. Became a theater airlift organization and participated in numerous exercises and humanitarian missions, 1952-1957. Tactical airlift operations, 1978-1980. Responsible for the 317th Wing’s flying operations. Campaign Streamers. World War II: Air Offensive Japan, New Guinea, Northern Solomons, Bismarck Archipelago, Western Pacific, Leyte, Luzon, World War II Army of Occupation (Japan and Germany). Decorations. Distinguished Unit Citations: Papua New Guinea, 30 Jan 1943-1 Feb 1943; Philippines, 16 Feb 1945-17 Feb 1945. Air Force Outstanding Unit Award: 1 Jun 1979-1 Apr 1980. Philippine Republic Presidential Unit Citation: 17 Nov 1944-4 Jul 1945. Emblem. Approved on 15 May 1958; newest rendition 12 Sep 2012.